SCHULZ Signed 1959 Original Sunday Comic Art. 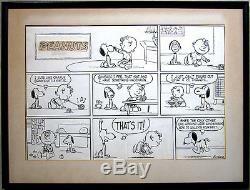 This is a rare original signed Peanuts Sunday comic strip ink drawing. By internationally acclaimed artist CHARLES M. This rare early original ink drawing is signed by the artist on the front lower right "Schulz". It was originally published on Sunday, August 30. 1959, and is dated in green pencil on the verso "8/30/59". It measures 17" x 23 ¼" (sheet), 15 ¼" x 22 ½" (image), and is matted and framed for a total size of 21" x 28" (there is wear to the mat and frame). It is in good condition aside from original tape remains in the margins, tape along the upper edge verso and an original fold down the center. This item is fresh to the market and is from the Southern California estate of the original owner. 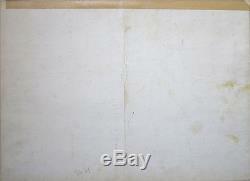 Scroll down on the item description to view additional photographs. Charles Schulz, the artist and writer of Peanuts, became one of the wealthiest men in America by using his childhood insecurities and failures as material for his comic strip. Charlie Brown, the strips likable loser, shared more than a first name with his creator and was inspired by Schulz bittersweet memories of his Midwestern boyhood. Charles Monroe Schulz was born in Minneapolis, Minnesota. His father, like Charlie Brown's, was a barber. Schulz parents nicknamed him Sparky after the racehorse Spark Plug in one of his favorite newspaper strips, Barney Google. He read the funnies avidly; copying all the characters he was fond of, especially those in Segar's Thimble Theatre and Percy Crosby's Skippy. Schulz skipped two grades in school, but still had to struggle with his studies. He wasn't very good at sports, felt he was awkward, had a bad complexion, was shy with girls, and had painful memories of having his cartoons rejected by the high school yearbook. While still in school, he started taking the Art Instruction Schools correspondence course in cartooning. During World War II, he served in the Army and was sent to Europe. Upon his return, he got a job with his old correspondence school and was employed there for five years. He became a letterer for Topix, a religious comic book. In that same year, he started drawing a feature entitled Lil Folks for the St. It went on to become the most widely read comic strip in the world, appearing daily in nearly 2,200 newspapers. In addition, Schulz and his syndicate, who split all profits, licensed the use of the Peanuts gang to a multitude of advertisers over the years. In 1987, he was inducted into the Cartoonist Hall of Fame, and has twice won the National Cartoonists Society Reuben Award. 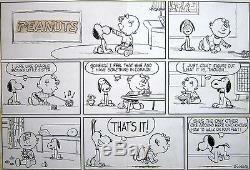 Until his death in early 2000, Schulz lived in Santa Rosa, California where he drew Peanuts from his home studio. FREE scheduling, supersized images and templates. Over 100,000,000 served. Get FREE counters from Vendio today! 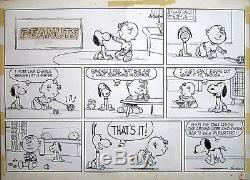 SCHULZ Signed 1959 Original Sunday Comic Art" is in sale since Friday, June 28, 2013. This item is in the category "Collectibles\Comics\Original Comic Art\Comic Strip Art". The seller is "sf-fineart" and is located in Los Angeles, California.